Vizio Thin + Light review (14-inch, 2012): how do the company's first laptops measure up? Pop quiz: which of the following is being marketed as an Ultrabook? Behind door number one, we have a 2.5-pound wisp of a laptop with a 13-inch screen, Core i5 CPU and 128GB SSD. Next up there's contestant number two, a 3.94-pound notebook with a 14-inch display, 500GB hard drive, and DVD burner. If you guessed the latter, well, congrats on reading that headline correctly, though we'd understand if you said that first option sounds like the Ultrabook. Indeed, Samsung's Series 5 Ultrabooks are a tad plumper than most, and look especially oversized next to the Series 9, that other ultraportable we've been describing. 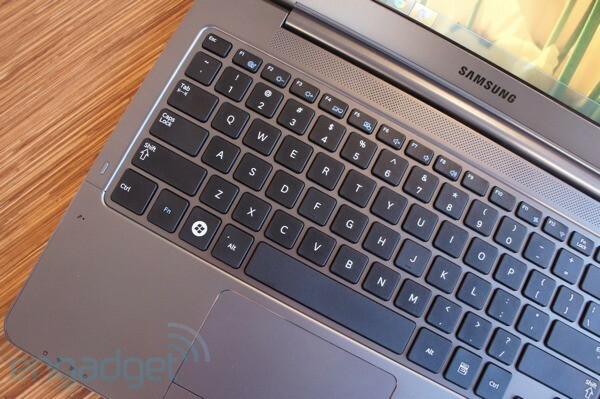 But it's not just Samsung using loose parameters to decide what counts as an Ultrabook. If Intel's own forecast is correct, half of the 75-plus models that go on sale this year will have 14- or 15-inch screens, and we've already seen a sampling of contenders from HP, Acer and Toshiba. The idea, say PC makers, is to lure in a more old-fashioned kind of customer, shoppers who aren't quite ready to ditch their DVD drive, and who aren't keen on stepping down to a too-small screen. At the same time, these laptops are thinner and lighter than similarly sized laptops, last longer on a charge and hold the promise of faster performance -- three reasons manufacturers can get away with charging more than they would for a plain 'ol laptop. In a nutshell, that's the value proposition behind the 14-inch Series 5, which costs $949 and comes bearing a Core i5 processor, 500GB hybrid hard drive and, of course, a DVD burner. 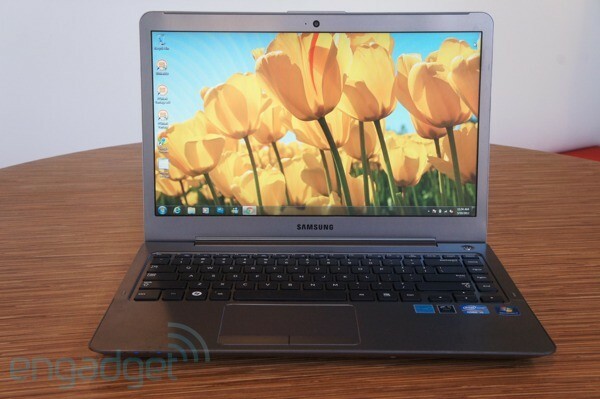 But do the benefits of a bigger Ultrabook outweigh the annoyances? And how does it compare to regular 14-inch laptops that aren't classified as ultraportables (and that don't command the Ultrabook tax)? Let's find out. This 14-inch Ultrabook doesn't justify its heft with long battery life or exceptional performance. How would you rate the Series 5 Ultra 14-inch? The curious (and absolutely intentional) thing about Intel's Ultrabook marketing blitz is that it's forced us to adjust the way we talk about laptop prices. About value. On what planet is a $949 laptop a budget item? One where it's touted as an Ultrabook, and other so-called Ultrabooks run in excess of $1,400, that's where. But in the real world (one where "Ultrabook" is just a fancy word for a lightweight laptop) $949 is hardly chump change, especially when $550 can buy you a system with a Core i3 processor, 4GB of RAM, a 500GB hard drive, six-cell battery and a (partly) metal design. So let's look at the Series 5 for what it is: an inexpensive Ultrabook, and a mid-range laptop. Though its design is inoffensive and tasteful, the build quality and attention to detail aren't any better than what other PC makers are offering for the same price (or less, even). With the exception of the plastic bottom, the laptop is fashioned completely out of gray aluminum -- a material that does an admirable job of resisting fingerprints, but chips easily around those sharp edges. If you look closely, it has roughly the same tapered shape as the impossibly thin Series 9, but it's tougher to appreciate on a machine that's not .58 inches thick. Other than Samsung's logo and a super thin metal band ringing the trackpad, you won't find any bold embellishments here, as on the $800 Dell XPS 14z, though depending on your tastes that could be a very good thing indeed. There's no getting around this next part: the 14-inch Series 5 is big as far as Ultrabooks go: heavy, and flush with ports. Granted, we'll soon see many more bigger-screened Ultrabooks, and despite having an optical drive, it manages to weigh less than the DVD-less HP Envy 14 Spectre (3.94 pounds versus 3.97). 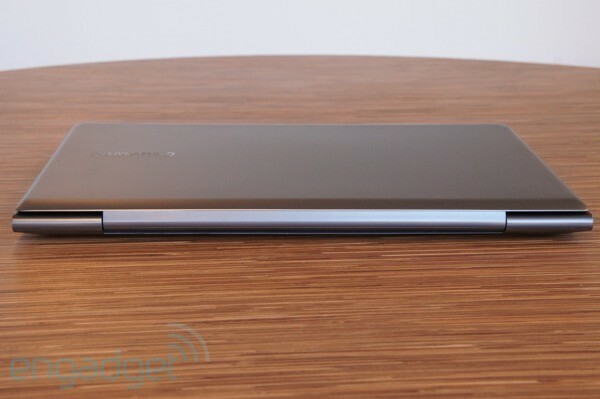 At least Samsung made room for lots of sockets in that .82-inch-thick (20.8mm) frame. Starting on the right edge, there's the tray-loading optical drive, along with a USB 2.0 port, Kensington lock slot and 4-in-1 memory card reader. Move around to the left and you'll find two USB 3.0 ports -- something no other Ultrabook save the Spectre can lay claim to. 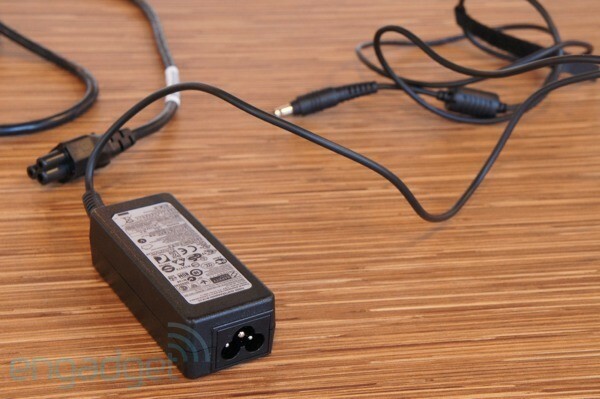 There's also an HDMI socket, Ethernet jack, combined headphone / mic port and -- who saw this coming? -- a VGA port! We can actually hear a few sarcastic snores coming from the peanut gallery, but for those of you with an aging projector lying around, well, you're in luck. 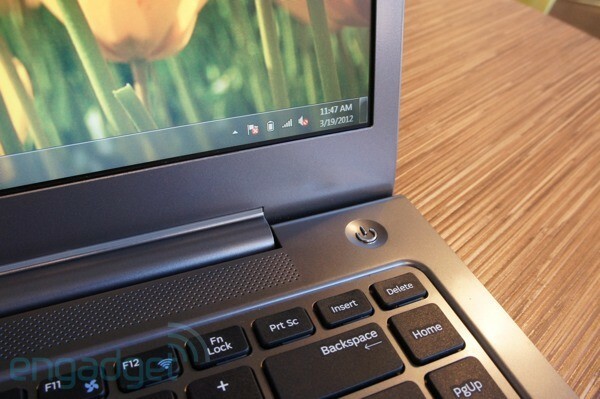 Like so many other Ultrabooks, the Series 5 is studded with shallow keys. (Come to think of it, we can't remember ever seeing a Samsung-made laptop with a cushy keyboard, but that's neither here nor there.) Fortunately, though, these are fairly easy to type on. The keys have a pleasant, ever-so slightly textured finish, and hold their own even under the pressure of furious typing. You might notice, though, that that wobbly screen starts to jiggle if you really start pounding the keys. When we first settled in with the Series 5, we worried the shrunken keys (Tab, Caps Lock, etc.) would pose a distraction, but we ultimately typed much of this review on them without fuss. The arrow keys are small, though -- smaller than you might expect on a laptop this size. If you're the kind of person who prefers arrows for highlighting text, you might fumble around at first as your fingers try to find them; with practice, you should be able to tap them without pausing to look. One thing you may or may not miss is a backlit keyboard. Without any dimly lit overnight flights to work through, we can't say we missed that glow, and knowing the battery isn't as robust as we would have liked (spoiler!) we're happy not to strain it further. Still, similarly priced Ultrabooks like the Dell XPS 13 and HP Folio have this, and it would have gone a long way in livening up the Series 5's otherwise staid design. 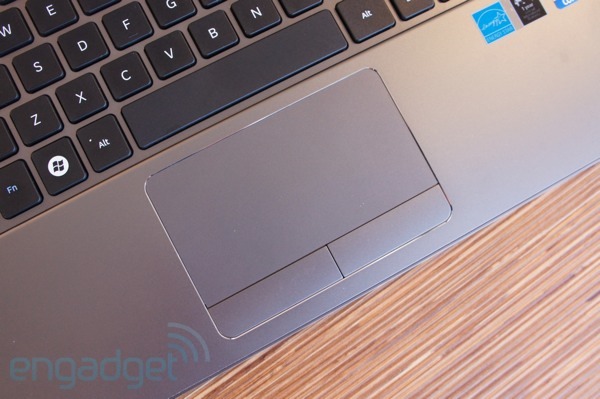 Here's a frequently asked question we get here at Engadget: is there a Windows trackpad you do like? Why yes, actually, but funnily enough, they all combine a pad with good old-fashioned touch buttons. (In other words, we've had quite enough of those seamless clickpads with flaky gestures and poor palm rejection.) Maybe that's why we're fond of the Series 5's touchpad, which offers a large, low-friction surface for smooth, precise tracking. Powered by Elan, it capably handles both two-finger scrolling and pinch-to-zoom, allowing you to carefully scale text without jumping from fine print to size 40 font. As you're poking around, you might notice some stuttering as you magnify web pages, but those transitions should look smoother when you're examining photos and PDFs. As for those touch buttons, they're tactile and generously sized (+2), though the buttons make a rather loud click every time you press them (-.5). After spending a week with the HP Spectre and its 1600 x 900 display, the Series 5's 1366 x 768 pixel count should feel like a step down. And to some extent, it is. Then again, we're talking about a machine that costs $450 less. Not to mention, pretty much every sub-$1,000 Ultrabook we know of offers the same middle-of-the-road resolution. If that's a deal-breaker for you, we'll direct you toward our Spectre, MacBook Air and ASUS Zenbook UX31 reviews with the usual caveat that a crisp display doesn't totally make up for flaws like a stiff clickpad either. Resolution aside, it still beats the other 1366 x 768 displays you'll find on other Ultrabooks, especially ones in this price category. Specifically, it's one of Samsung's SuperBright screens, which means it has 300 nits of brightness (not to be confused with the 450-nit SuperBright Plus panel inside the Series 9). As luck would have it, it has a matte finish, too, though somehow the viewing angles are still fairly narrow. The screen still gets washed out when you dip it forward or watch from oblique angles, but at least that matte coating cut down on glare from overhead lights and nearby windows. To wit, it's nice that you can't really see the vertical lines in the LCD unless you lean close. That's more than we can say about that eye-popping Radiance panel on the Spectre. The speaker strip stretching across the keyboard deck pushes out sound that manages not to be too tinny -- at least, for pop and rock songs. The middling audio quality is most obvious with rap and other bass-heavy tracks, where low notes get lost in the shuffle of higher-pitched synthesizers. Like an increasing number of other laptops, the Series 5 makes use of Intel's Wireless Display technology, which you can use to mirror your desktop on an HDTV or external monitor. In addition to blowing up your desktop on a bigger screen, you can also stream 1080p movies, a step up from the 720p resolution cap imposed by early WiDi laptops. To get a feel for how it works, we suggest you read this oldie-but-goodie of a review. Suffice to say, though, the streaming tends to be fluid, and the third-party adapters are usually a cinch to set up. Note: the higher the score the better. With one important exception, the Series 5 has the same innards as the Dell XPS 13 and other Ultrabooks we've tested recently: a 1.6GHz Core i5-2467M CPU, 4GB of RAM and integrated HD 3000 graphics. Wash, rinse, repeat, right? Not exactly. The difference is that this guy runs on a 500GB 5,400RPM drive with 16GB of flash memory -- double the 8GB used in Samsung's higher-end Series 7 Chronos. Though it's not without drawbacks (more on that in a moment), it does exactly what it promises to do: accelerate the start-up process, cut resume times and launch apps quickly. The machine boots in a brisk 21 seconds, at which point you can immediately start clicking things -- no waiting around for Windows to finish loading. It also wakes from sleep in less than two seconds, as any good Ultrabook should. And despite its lack of an SSD, it notched a similar score in PCMark Vantage as the $900 Folio 13, which does have a solid-state drive. What's more, the Series 5 does a slightly better job dissipating heat than either the XPS 13 or the Spectre, both of which we've tested recently. After five hours of working in Chrome, we could feel some lukewarm air coming through the vents, but it was still cooler than either of those two other machines would have been after some extended web surfing. Without discrete graphics or an SSD, its performance trails beefier laptops and smaller Ultrabooks. Still, when it comes to disk performance, it's clear this hybrid drive is no substitute for an SSD. Using the benchmark ATTO as our guide, we saw peak read and write speeds of 111 MB/s in each category. On the one hand, that's better than the 80 MB/s reads and 75 MB/s writes you'd get from the hybrid HDD inside of the $800 Acer Aspire S3, but it's no match for a proper solid-state drive. Even the Folio 13 can hit 232 MB/s reads and 192 MB/s writes, and that's hardly even the fastest SSD the current crop of Ultrabooks have to offer (that would be the Zenbook UX31's). With very few exceptions, the Ultrabooks we test limp along on Intel HD 3000 graphics, so if gaming is a passion of yours, look elsewhere. In this case, the Series 5's average score on the benchmark 3DMark06 is exceptionally low, though in practice gaming isn't much smoother on better-scoring machines like the pricey Spectre. In The Sims, it's a difference between 62 frames per second and 65; in Call of Duty, it means even with 1024 x 768 resolution you're sputtering along at 10fps, as opposed to 15fps. Either way, Intel's graphics solution has yet to fail us when it comes to simple things like zooming in on and lightly editing photos. It's worth noting, though, that these performance comparisons are artificial in a way: so far, we've only been pitting the Series 5 against other so-called Ultrabooks, with low-voltage processors and integrated graphics. But this laptop is large enough that it might also make sense to stack it up against a "full-fledged" 14-inch laptop -- you know, one that's a little too muscular to be called an Ultrabook. Do that and you'll see something like the XPS 14z comes out ahead (so does the lower-end Inspiron 14z, by some metrics). Of course, this isn't a perfect apples-to-apples comparison, since the XPS 14z we reviewed is worth hundreds of dollars more. The point is, you could buy a machine like that and pay to add discrete graphics and extra RAM if fine-tuning the performance was that important to you. The 14-inch Series 5 Ultrabook comes in just one configuration, though intrepid types can replace the RAM and drive (but not the battery) on their own. You'd think that a relatively hefty Ultrabook would yield more robust battery life, right? In fact, that goes for phones and tablets, too: most of us can handle a few extra ounces (or pounds, as it were), but there ought to be some sort of benefit, like a larger battery, or maybe an extra helping of ports. In this case, the 14-inch Series 5 brings an optical drive, but nothing in the way of extended longevity. In our standard battery test (WiFi on, movie looping off the disk, brightness fixed at 65 percent), it managed just a hair over five hours. Sure, that's longer than you'd get with the even-heavier Dell XPS 14z, but it falls short of most every other Ultrabook we've tested. Give up the optical drive and you should enjoy an extra hour of runtime with the HP Folio 13. Even if you do need a DVD burner, the Dell Inspiron 14z ($550 and up) and up lasts more than six and a half hours with a six-cell battery. On the plus side, we noticed the laptop sips very little power while asleep, so you could theoretically go days without charging it if you only needed to respond to emails in short bursts. The apps pre-installed here are a mostly benign bunch, including CyberLink Media Suite, MediaShow, Power2Go, PowerDirector and the YouCam webcam app; Skype 4.2; Norton Online Backup; Microsoft Starter 2010 (natch); and Windows Live Essentials 2011. The machine also comes loaded with a 60-day trial of Norton Internet Security 2012. If anything, we'd normally complain about annoying pop-ups and dialog boxes entreating us to purchase the product, but in this case we also ran afoul of the FileInsight feature, which wouldn't let us download a .exe file from box.net that we've successfully installed on every PC and Mac we've tested. None! The 14-inch Series 5 Ultrabook is available in one configuration, the $949 number we've been describing in detail. If you can do without the optical drive, Sammy's also selling a 13-inch model, available in two flavors. Both have the same 1.6GHz Core i5-2467M processor as the 14-inch version, along with 4GB of RAM, a 300-nit, 1366 x 768 display and integrated Intel graphics. The lower-end $900 version also has the same 500GB hybrid drive as the 14-incher, though the $1,100 model steps up to a 128GB SSD, putting it in line with similarly priced competitors. At 3.24 pounds, it's heavier than most 13-inch Ultrabooks, though it's still a shade lighter than the 3.3-pound Folio 13. With the 14-inch Series 5 the line between Intel-sanctioned Ultrabooks and regular laptops is blurrier. 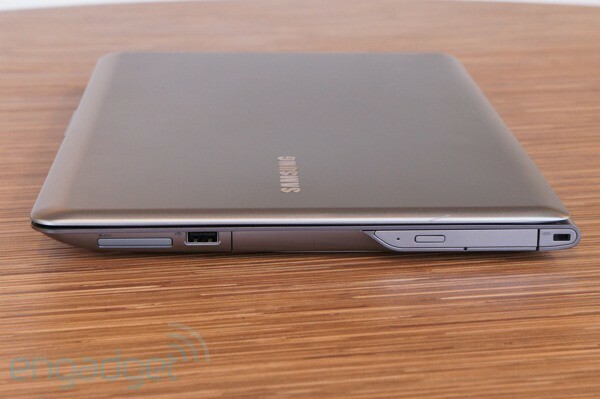 So Samsung's marketing this 14-inch laptop with an optical drive as an Ultrabook. 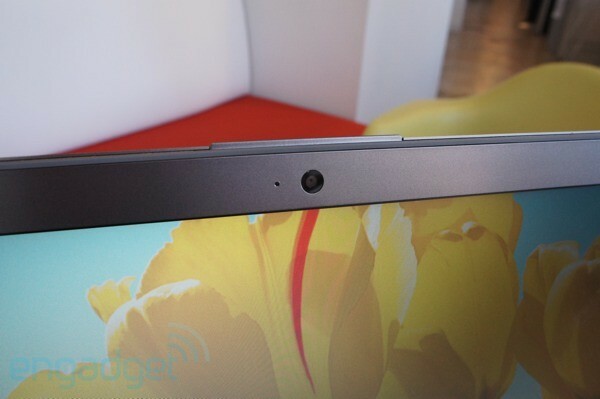 Given that positioning, then, we'll kick off your comparison shopping with a brief nod to other Ultrabooks. To recap this review thus far, its display is better than most machines you'll find in this price range, though the performance isn't necessarily faster, and the battery life is markedly shorter. The selection of ports is unrivaled, save for the Spectre, which has two USB 3.0 ports (but no VGA socket or optical drive, neither of which you'll necessarily miss). As for design, we tend to think the Dell XPS 13 and arguably even the Folio 13 are better looking than this, though the Series 5 still wins when it comes to having both a comfortable keyboard and trackpad. All told, the HP Folio 13 is still our favorite of the lower-cost Ultrabooks -- it's not perfect, but it still offers the best combination of performance, battery life, ergonomics and tasteful design. Typically with Ultrabook reviews, we only mention other ultraportables in this comparison shopping section because, well, most machines in that size and weight class are Ultrabooks. With the 14-inch Series 5, though, the line between Intel-sanctioned Ultrabooks and regular laptops is blurrier. Given the larger screen size, its relative heft and that optical drive, why not compare it to thin-and-light notebooks that are just a smidge too heavy to be called Ultrabooks? Indeed, the field of 14-inchers is large, and we haven't tested each and every one, but we do want to share a few highlights. For starters, the Dell XPS 14z we've been name-dropping throughout this review now starts at $800 with a more polished (if somewhat gaudier) all-metal design, a comfortable keyboard-and-trackpad combo and an optional discrete GPU (not that the graphics performance is that impressive). Keep in mind, though, that it's not as compact as the Series 5, at 4.36 pounds and .9 inches thick. The little brother to that, the Inspiron 14z ($550 and up) offers solid performance and exceptionally long battery life, though we weren't as fond of the trackpad. Aside from the Spectre, HP doesn't offer many 14-inch laptops, and the one it does -- the g4t -- is decidedly low-end, starting at $480 with a Core i3 CPU, 4GB of RAM and a 500GB hard drive. Not bad specs for everyday computing, but you'd also have to walk away from all the speed, longevity and portability that Ultrabooks are promising. Here, you'd have to make do with a 4.68-pound system and battery life rated for a little over four hours, which doesn't bode well for real-world use. This go-round, we suggest leapfrogging HP and focusing on what other manufacturers have to offer. Like Acer, whose lineup includes the recently announced Timeline Ultra series, which caters to precisely the same person who might be considering the Series 5: someone who can't bear to part with that optical drive, but still craves something relatively thin, light and affordable. (No word on US pricing, though we've been told in the past prices would fall in line with the company's current TimelineX offerings.) What we do know is that the 15-inch Timeline Ultra M3 is set to ship this month with NVIDIA's new 28nm Kepler graphics, making it the first Ultra to hit the market with a discrete GPU. As for Sony, even the lightest of its 14-inch laptops, the E series, is on the heavy side, at 5.08 pounds, but if you're flexible on screen size, we'd also recommend the 13-inch SA / SB series (now $650 and up), which has a clean, timeless design, lightweight build, switchable graphics, healthy battery life and an optical drive, putting it in the same class as the 14-inch Series 5. Since we reviewed it last year, we've been recommending it left and right as a solid all-purpose laptop. If you're in the market for a mid-sized laptop with a DVD burner for occasional backups, we can see why you'd look twice at the Series 5: it's thinner and lighter than most 14-inchers. 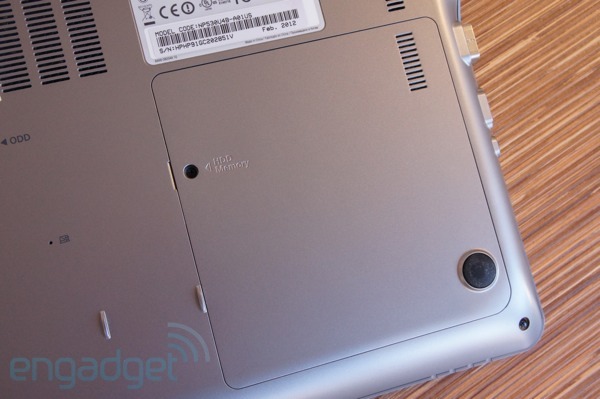 It also has a pleasant keyboard-and-trackpad combo -- something we can't say about all Ultrabooks. The problem is, without discrete graphics or an SSD, its performance trails both beefier laptops and smaller Ultrabooks. If you can live without the optical drive, most of the 13-inch Ultras we've tested are faster and yield longer battery life. And though traditional 14-inch laptops are heavier, their performance tends to be more robust, and their runtime is only marginally worse than the Series 5's (there are even exceptional machines like the $550 Dell Inspiron 14z, which endures almost two hours longer). If you're going to spend $900 on a so-called Ultrabook, you may as well choose something like the HP Folio 13, which weighs less, performs better, lasts longer on a charge and has a healthy selection of ports (just not a high-quality display). Or, you know, you could shrug your shoulders at the Ultrabook fad and choose to spend hundreds of dollars less on something decently performing, but a little less portable.